Dallas is on the verge of adopting its first comprehensive housing policy. There's a lot to cover, but here's a quick skim. 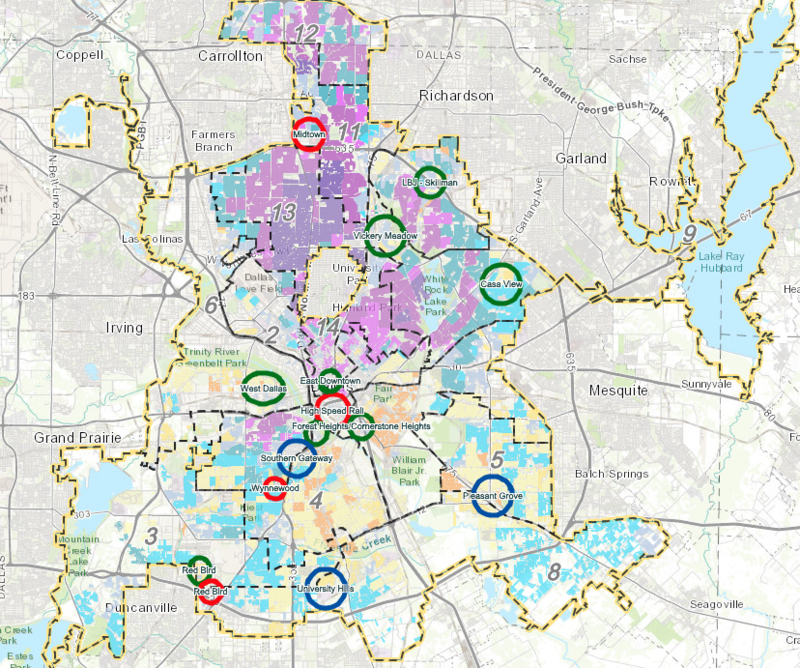 Redevelopment areas, marked on the map by red circles, are where a project that could serve as a spur for further development, such as the Red Bird mall revitalization, is already set to begin “within the next 12 months.” Those projects, per the housing policy, must be incentivized to contain mixed-income housing. A stabilization area (green circle) indicates a neighborhood where redevelopment threatens to displace the lower-income residents who are already there. Hence the green circle near the Margaret Hunt Hill Bridge in West Dallas, the most visible example of the city’s affordable housing crisis and local discussions of gentrification. The housing policy says these areas should be zoned to encourage increased density, and to include more “accessory dwelling units,” such as garage apartments. Emerging market area (blue circle) refers to a place that needs a lot of work, including “intensive environmental enhancements, public infrastructure assessments and corrective plans, code enforcement, code lien foreclosure, nuisance property abatement, establishment of a crime watch or crime reduction strategies, and neighborhood resource development.” You’ll find blue circles near UNT Dallas and around the Southern Gateway, where work has begun on a $666 million highway rebuild, complete with a deck park.